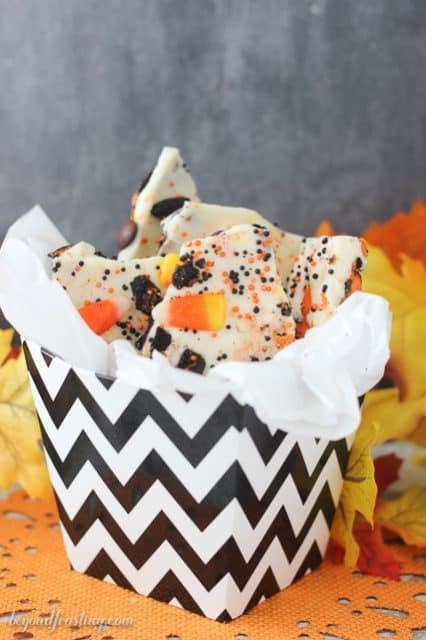 This Candy Corn Candy Bark is a great excuse to use up halloween candy and it’s a quick and easy gift for a teacher or a neighbor! This weekend we had a date night planned to go see a show in a local bar that we had never been to. When we pulled up it didn’t appear to be very busy and it was a little dicey looking. We were a bit surprised when we opened the door and only two people were inside besides the bartender and security guards. Umm okay. When we sat at the bar, we asked about the show and pulled out our tickets to find that the concert was actually 2 days earlier. FAIL. We were too busy to even notice we missed the show! We were slightly embarrassed, downed a beer and quickly left. We laughed it off as we continued on the grocery store for our exciting Saturday night. Every year I bring the sweets for our company Halloween party. It’s so fun to see everyone’s kids dressed up! 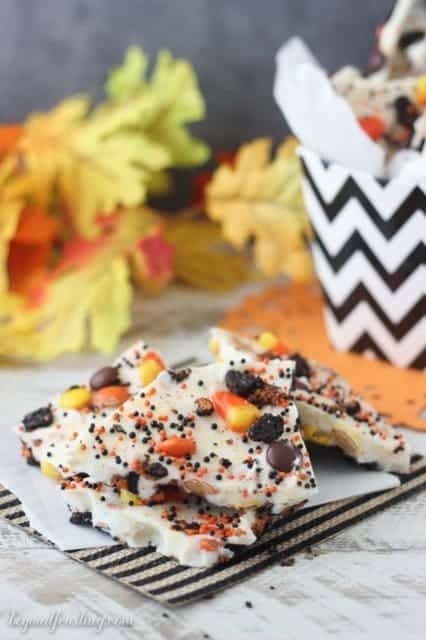 I am thinking I should bring this Candy Corn Candy Bark to the party this year! 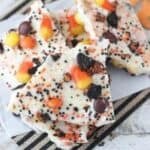 This bark is made with Wilton’s limited edition Candy Corn Candy Melts. It is perfect for you candy corn lovers, you know who you are! I can’t eat a lot of candy corn on it’s own, but when combined with all the goodness in this bark! This is also a quick treat that you don’t’ have to fuss over. It even makes a great gift for a teacher or neighbor. First you just need to melt the candy melts with a little bit of Crisco which helps them thin out the candy melts. 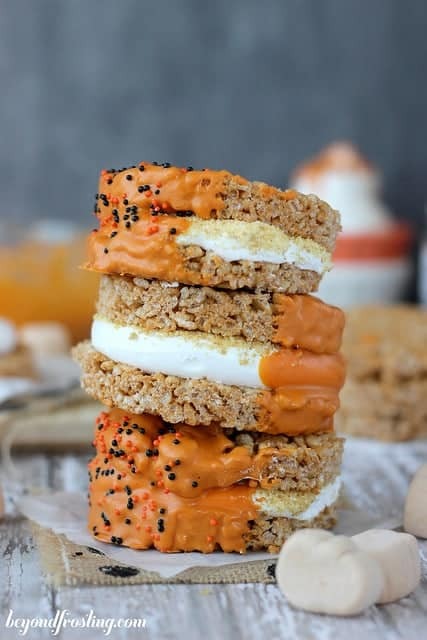 Pour it over some crushed Oreos, candy corn and peanut butter candies like Reese’s Pieces or something and save a handful of each to sprinkle on top. Just throw a little sprinkles on top for fun! It helps to refrigerate the bark until it’s firm and then just break it into pieces. The best thing about barks is that you can add any type of candy or cookies that you want. 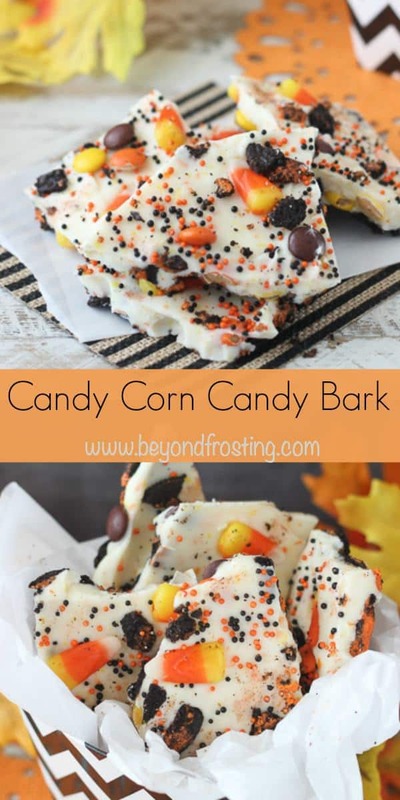 You could even mix the Candy Corn melts with another flavor! This post is sponsored by Wilton. All options are my own. As a Wilton Sweet Treat Team Member, I am compensated for my time to create these recipes. Thank you for supporting the brands I love! Line a 9″x13” pan with a Silpat or tin foil If using tin foil, allow an extra inch of foil up on the sides so you can easily lift the bark out of the pan. In a large microwave-safe bowl, melt Candy Corn Candy Melts together with Crisco for 30 seconds at a time, stirring after each 30-second interval until melted. Set aside to cool. Crush Oreos with a Ziploc bag and rolling pin by gently patting the Oreos to break them apart; sprinkle them on the bottom of the pan. 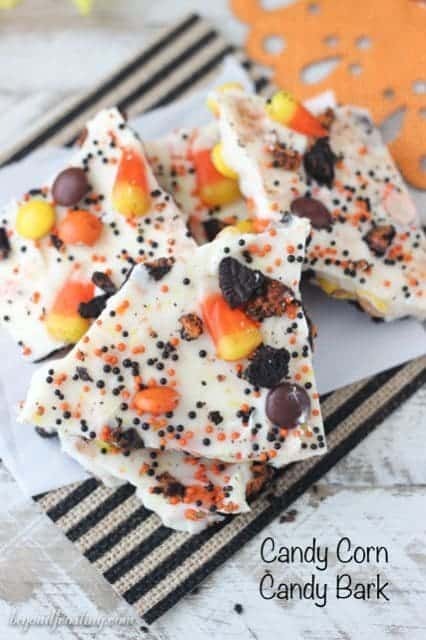 Mix in candy corn and peanut butter candies. Pour candy melts over top and gently spread to even it out. Sprinkle any leftovers on top and add some sprinkles. Allow bark to harden either at room temperature or in the refrigerator. YUM! 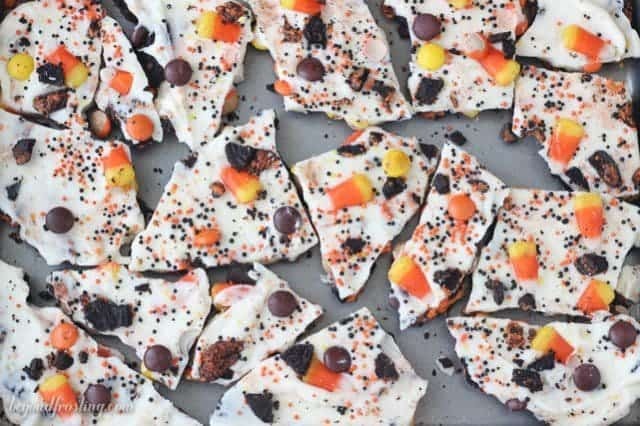 I prefer to eat my candy corn in bark from now on!!! What a fun Halloween treat. I love, love making candy bark! It’s easy, festive and perfect for any event! This Halloween version goes quickly I’m sure! 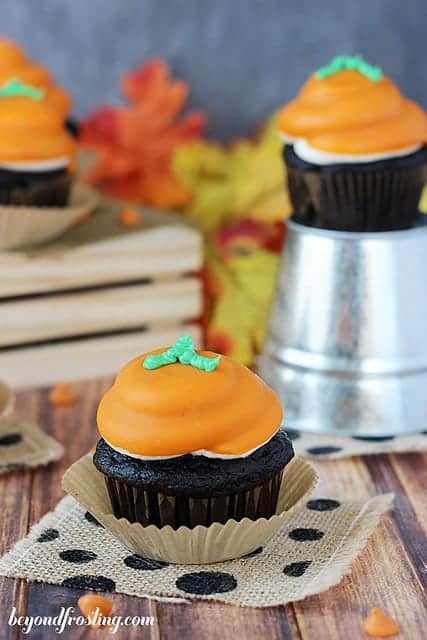 What a fun treat to bring to a Halloween party!